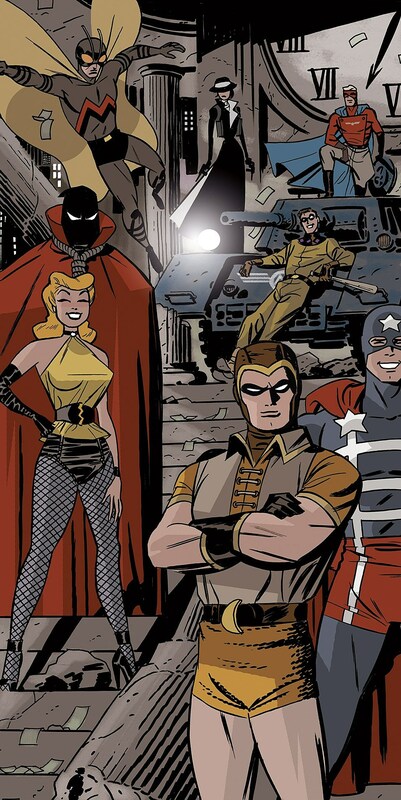 A new piece of art by Darwyn Cooke promoting his take on The Minutemen's pre-Watchmen adventures arrived online today as part of Fast Company's interview with Alan Moore. It seems like an odd way to reveal the exclusive promo art considering the original Watchmen writer uses the interview to continue damning DC Comics' decision to profit from he and Dave Gibbons' lauded 1986 work by releasing a series of Before Watchmen prequel comics by various creators without his consent. DC Comics' Dan DiDio and Jim Lee also issue statements addressing the matter that simultaneously praise Moore and argue that publishing more Watchmen material against his wishes is a good thing for readers, creators and even the characters themselves. Perhaps most interestingly, the interview addresses why Moore hasn't taken legal action against DC over the years as he became less and less satisfied with the terms of his original contract with the publisher. Moore's discontent with DC's treatment of Watchmen is well-documented, though every new permutation of the work -- such as the 2009 live action film from Warner Bros. and its numerous licensed products -- summon, in his words, "a toxic cloud of memories." These memories include severed friendships with Gibbons, alleged bullying from DC and an initial contract signed by Moore that he says he's continued to find new reasons to consider unfair. So why not take legal action? It seems Moore would rather have the legal ability to criticize DC's decisions than be silenced by a lawsuit he feels would be exhausting and potentially unwinnable, at least on his terms. "I thought about it for a while--I could perhaps sue, although I suspect DC would be very comfortable with that," Moore told Fast Company. "They have a whole battery of lawyers who could continue to fight this case for decades. And it's not like I'm after money. It's always been about the dignity and integrity of the work. I just want them not to do something. There's no point in wasting resources for decades, when effectively, if there's a legal case, I'd be prohibited from speaking about it, which DC is more worried about." Moore's comments regarding DC's lawyers aren't unfounded. The highly-publicized legal battle between DC and the heirs of Superman co-creators Jerry Siegel and Joe Shuster, though fought under a different set of circumstances, is a clear demonstration of the publisher's stamina in court. For their part, DC co-publishers Dan DiDio and Jim Lee are staying positive and focusing on fan concerns over quality rather than commenting on the creator ownership issues that the comics community has been most vocal about. DiDio, for the first time since the project was announced two weeks ago, acknowledges Moore's lack of involvement and explains to Fast Company that the prequels have Gibbons' support. His argument is essentially that hiring highly regarded talent mitigates the controversy of DC's publishing decision. "We know this project will be under the magnifying lens," DiDio told Fast Company, "Watchmen is a critical favorite, a cultural touch point. We believe when fans see the issues this summer, they'll be as excited as we are today." Lee characterizes the decision as something of an inevitable business decision that keeps an intellectual property fresh and profitable, stating that DC would, "be remiss not to expand upon and explore these characters and their stories. We're committed to being an industry leader, which means making bold creative moves."